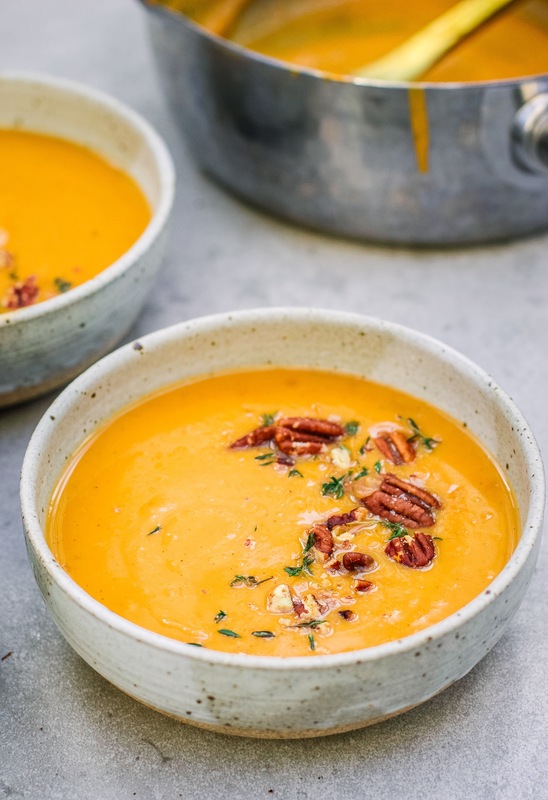 This Maple Sweet Potato Soup is so delicious with only a few ingredients. Usually I make soups with loads of different herbs and spices but I love the simplicity and subtle sweetness of this one- it’s like a hug in bowl. Preheat the oven to 200’C. Peel and chop your sweet potatoes into cubes. Lay the cubes out on a roasting tray. Whisk together the maple syrup and 1 tablespoon of olive oil and and drizzle it over them, tossing to coat them evenly. Sprinkle over a good pinch of sea salt and roast for about 20 minutes, tossing in the middle, until tender. Once they’ve been in for 15 minutes, put a large pot on medium heat and add about two tablespoons of olive oil. Sprinkle in the cinnamon, followed by the onions and cook, tossing often, for about 5 minutes until soft and sweet. Take the sweet potatoes out of the oven and turn the oven down to 180’C. Add the sweet potatoes to the pot with the stock and let the stock simmer away for about 10 minutes. Roast the pecans at 180’C for about 6-8 minutes until toasted. 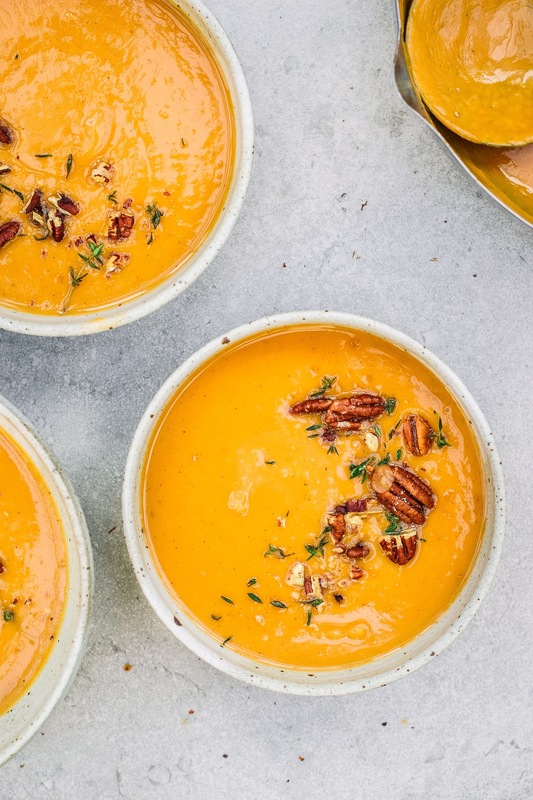 Use a hand blender to blend everything into a smooth, creamy soup. Or add everything to your blender, blend until smooth and then return it to the pot. Serve the soup with the roasted pecans crumbled on top and a good pinch of sea salt. Thyme makes a lovely garnish too. Made this soup yesterday it was gorgoeus. Will be making it again so easy to make.